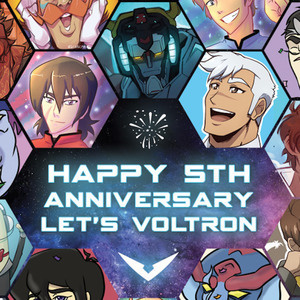 This is the first of 2 parts for our 5th Anniversary of Let's Voltron: The Official Voltron Podcast, which includes 3 special surprise guests from the Voltron Universe! During each guest segment, we give away 1 of the 5 total prizes in our #LetsVoltron5 contest! So, there are 3 prizes given away in Part 1! Neil Ross is our 1st special guest and despite the fact that he was one of the 6 original voice actors to work on Voltron: Defender of the Universe back in 1984, he has blessed us by having 2 new projects come out recently. He was the voice of Voltron in the Happy Honda Days ad we talked about in our last podcast, and he wrote a new autobiography called "Vocal Recall: A Life in Radio and Voiceovers". We are proud to have Neil on the podcast for the third time and to see that he mentioned listening to our podcast in his book! He doesn't mention "Let's Voltron podcast" by name, but he was talking about our interview with Franklin Cofod in the 33rd Chapter of the book. If you would like to pick up Neil's book, there are 4 different formats to choose, including paperback, audiobook (read by Neil himself, and doing some of the voices he's famous for! ), Kindle, and PDF file. Our 2nd guest on the 5th Anniversary Podcast is Bob Koplar, President of World Events Productions in St. Louis, Missouri, the copyright, IP and trademark owner of Voltron. Bob gives us every indication that both Voltron merchandise and Voltron projects will continue in the future, although there is nothing next in line after Voltron Legendary Defender just yet. Our 3rd guest on the 5th Anniversary Podcast is Jeremy Corray, VP of Digital Entertainment at CoolFire Studios, and also the former Creative Director of WEP and the former co-host of Let's Voltron: The Official Voltron Podcast. You never know what special information about Voltron that Jeremy might reveal, as he gives us his Top 5 Voltron moments in his career. We hope to have Jeremy back for another podcast soon, where he reveals some of the secrets behind "what almost was" or "what might have been" while he was working with Voltron at WEP. Our 5th Anniversary Podcast didn't only come with 2 great podcast episodes. It also came with a really cool bunch of designs from 5 amazing Voltron fan artists! Although we don't introduce the artists for this 5th Anniversary Podcast until Part 2, we want to share these designs with you here, AND let you know you can buy these on our TeePublic store! We are so proud of the work that our "5th Anniversary Five" artists did on these designs, so please make sure you listen to Part 2 of the 5th Anniversary Podcast to hear how this wonderful collaboration came together like Voltron!